Not another book review…I promise! I pulled out Morning and Evening a month ago…it had been awhile since I had read it…oh how happy I am! This is the definition of a classic…so good…so rich…so penetrating. Did I read it this morning…no! I woke up too late and the day was off to a very quick start…and I felt it all day long…longing to just have a moment to sit and soak…and so…all and all…sometimes missing that morning time…does just that…it makes you miss it…making it more likely that you won’t be quick to miss it again. Let me learn from Ruth, the gleaner. As she went out to gather the ears of corn, so must I go forth into the fields of prayer, meditation, the ordinances, and hearing the word to gather spiritual food. The gleaner gathers her portion ear by ear; her gains are little by little: so must I be content to search for single truths, if there be no greater plenty of them. Every ear helps to make a bundle, and every gospel lesson assists in making us wise unto salvation. The gleaner keeps her eyes open: if she stumbled among the stubble in a dream, she would have no load to carry home rejoicingly at eventide. I must be watchful in religious exercises lest they become unprofitable to me; I fear I have lost much already-O that I may rightly estimate my opportunities, and glean with greater diligence. The gleaner stoops for all she finds, and so must I. High spirits criticize and object, but lowly minds glean and receive benefit. A humble heart is a great help towards profitably hearing the gospel. The engrafted soul-saving word is not received except with meekness. A stiff back makes a bad gleaner; down, master pride, thou art a vile robber, not to be endured for a moment. What the gleaner gathers she holds: if she dropped one ear to find another, the result of her day’s work would be but scant; she is as careful to retain as to obtain, and so at last her gains are great. How often do I forget all that I hear; the second truth pushes the first out of my head, and so my reading and hearing end in much ado about nothing! Do I feel duly the importance of storing up the truth? A hungry belly makes the gleaner wise; if there be no corn in her hand, there will be no bread on her table; she labours under the sense of necessity, and hence her tread is nimble and her grasp is firm. I have even a greater necessity, Lord, help me to feel it, that it may urge me onward to glean in fields which yield so plenteous a reward to diligence. 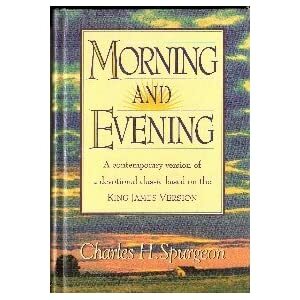 We used this churchwide as our devotional a few years ago and it is a classic. Spurgeon says it so well. Hope you are doing well, Helen. I think of you often. Hugs.